Percutaneous closure of an atrial septal defect (ASD) has been established as a safe and effective alternative to surgical management. , Atrial tachyarrhythmias are well-documented sequelae of ASD surgical and percutaneous closure, associated with substantial morbidity. We describe a patient in whom an Amplatzer septal occluder device was used to close a moderately large ASD who subsequently developed incessant atrial tachycardia treated successfully by radiofrequency ablation. A 41-year-old male who had only recently been diagnosed with a moderately large secundum ASD was referred to our heart center. He was known to have a heart murmur since the age of 16 years but never underwent detailed cardiac evaluation. He had a 6-month history of symptoms including shortness of breath, easy fatigability and recurrent swelling of both lower extremities. His previous medical history was significant only for the diagnosis of reactive airway disease. He was on no scheduled medications. On examination, he had transcutaneous oxygen saturations of 100% in room air with fixed splitting of the second heart sound and a grade 2/6 mid-systolic murmur best audible at the upper left sternal border. Transthoracic echocardiographic assessment revealed the presence of a moderately large and hemodynamically significant secundum ASD. The patient was admitted to the pediatric cardiology service, for closure of ASD with an Amplatzer septal occluder (AGA Medical, Golden Valley, MN). Postprocedure transesophageal echocardiography revealed no significant residual shunting. He had an unremarkable postoperative course and was discharged the following day. Three months later he complained of recurrent episodes of palpitations. Holter monitoring showed frequent episodes of long RP tachycardia. Treatment with β-blockers was initiated without significant improvement. 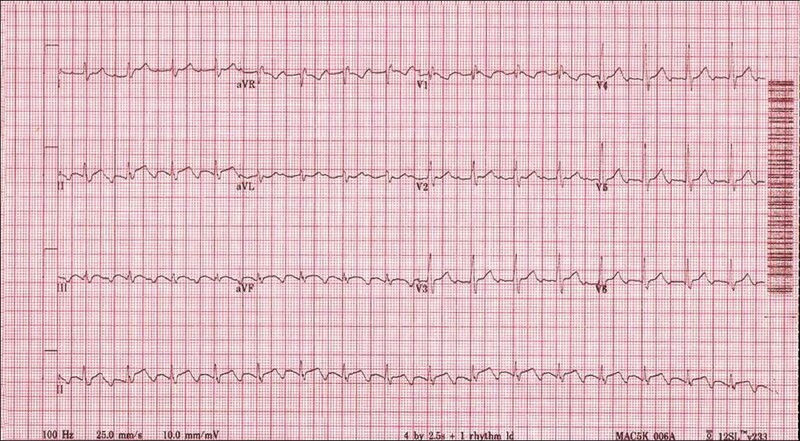 The patient was admitted twice to the adult cardiology service with incessant atrial tachycardia with 2:1 conduction [Figure 1]. Treatment options were discussed with the patient and he subsequently underwent electrophysiological study. The study was done during atrial tachycardia using the CARTO electroanatomical mapping and navigation system. As shown in [Figure 2], electroanatomical map of the right atrium showed intra-atrial macro-reentrant tachycardia circulating around the Amplatzer closure devise. Entrainment maneuver (by demonstrating entrainment with concealed fusion, and postpacing interval similar to the tachycardia cycle length) and local electrogram (by showing fractionated and low amplitude electrogram) identified critical isthmus between the amplatzer device and inferior vena cava. Linear radiofrequency (RF) ablation line was created bridging the Amplatzer device and the inferior vena cava, anterior to the coronary sinus os. The completion of this line terminated the arrhythmia. Cardiac dysrhythmias before and after surgical closure of ASD occur in up to 40% of patients and are associated with substantial morbidity. Of special interest is the intra-atrial macro-reenterant tachycardia following cardiac surgery. In these cases, the central obstacle of the circuit is an atriotomy scar, a septal prosthetic patch or a suture line. During electrophysiological mapping, low voltage electrograms characterize areas of scar and flat bipolar recordings characterize the prosthetic patch. Several studies demonstrated the feasibility of RF catheter ablation, targeting anatomical areas critical to the maintenance of the arrhythmia circuit, as a specific therapy for these arrhythmias, with different short- and long-term clinical outcomes. 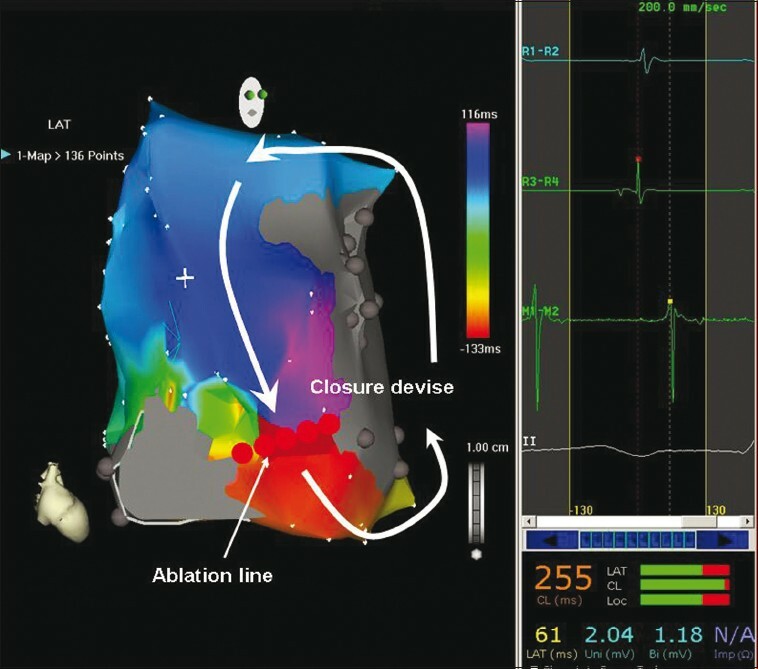 , The recent development of the electroanatomical mapping/ablation system (CARTO) has shown promising results in defining the arrhythmia circuit, facilitating diagnosis and guiding ablative therapy. Transcatheter closure of ASD using the Amplatzer occluder has gained widening interest in recent years with high success and low complications rates. ,, The relation between cardiac dysrhythmias and transcatheter closure of ASDs is well-known. In patients of ASD most of tachyarrhythmias are isthmus dependent. The unique thing in our report, that the tachycardia is not isthmus dependent or surgical scar-related but is device-related. Transcatheter ASD closure are not associated with postoperative scars; however, the presence of a metal implant on the atrial septum may potentially predispose to arrhythmia as was the case here. We do not know exactly how the presence of the device is related to the mechanism of the arrhythmia. It could be that the device changes the electrophysiological properties of atrial tissue around the device. Finally, we showed that RF ablation shortly after the Amplatzer device implantation could be safe and effective. 1. Fischer G, Stieh J, Uebing A, Hoffmann U, Morf G, Kramer HH. Experience with transcatheter closure of secundum atrial septal defects using the Amplatzer septal occluder: A single centre study in 236 consecutive patients. Heart 2003;89:199-204. 2. Du ZD, Hijazi ZM, Kleinman CS, Silverman NH, Larntz K, Amplatzer investigators. Comparison between transcatheter and surgical closure of secundum atrial septal defect in children and adults: Results of a multicenter nonrandomized trial. J Am Coll Cardiol 2002;39:1836-44. 3. Chessa M, Carminati M, Butera G, Bini RM, Drago M, Rosti L, et al. Early and late complications associated with transcatheter occlusion of secundum atrial septal defect. J Am Coll Cardiol 2002;39:1061-5. 4. Gepstein L, Hayam G, Ben-Haim SA. A novel method for nonfluoroscopic catheter-based electroanatomical mapping of the heart. In vitro and in vivo accuracy results. Circulation 1997;95:1611-22. 5. Gatzoulis MA, Freeman MA, Siu SC, Webb GD, Harris L. Atrial arrhythmia after surgical closure of atrial septal defects in adults. N Engl J Med 1999;340:839-46. 6. Saoudi N, Cosio F, Waldo A, Chen SA, Iesaka Y, Lesh M, et al. A classification of atrial flutter and regular atrial tachycardia according to electrophysiological mechanisms and anatomical bases; a statement from a joint expert group from the working group of arrhythmias of the European society of cardiology and the North American society of pacing and electrophysiology. Eur Heart J 2001;22:1162-82. 7. Triedman JK, Bergau DM, Saul JP, Epstein MR, Walsh EP. Efficacy of radiofrequency ablation for control of intraatrial reentrant tachycardia in patients with congenital heart disease. J Am Coll Cardiol 1997;30:1032-8. 8. Dorostkar PC, Cheng J, Scheinman MM. Electroanatomical mapping and ablation of the substrate supporting intraatrial reentrant tachycardia after palliation for complex congenital heart disease. Pacing Clin Electrophysiol 1998;21:1810-9. 9. Juneja R, Naik N. Tachyarrhythmias in infants and children with congenital heart disease. Indian Heart J. 2007;59(1 Suppl A):A27-40.